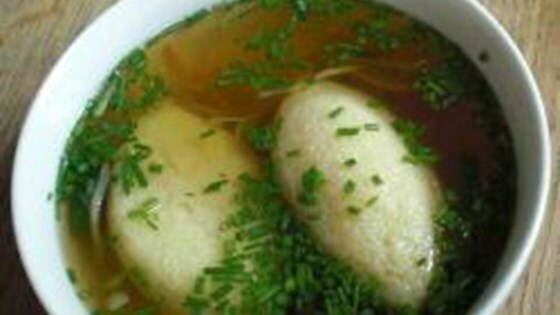 "There is nothing better than a semolina dumpling soup made from beef stock. This is a German dish called Griessnockerlsuppe. Semolina dumplings are suitable for freezing, as is the stock. The boiled beef can be used for other dishes, such as marinated beef salad." Place beef bones and beef shank in a large pot; add cold water, onion, peppercorns, bay leaf, and salt. Bring to a boil; cook, skimming foam from the top, for 30 minutes. Reduce heat and simmer stock for 1 hour. Stir parsnip, turnip, leek, carrot, and celery into the stock; cook for 1 hour more. Strain stock through a fine-mesh sieve and return to the pot; season with salt and ground black pepper. Cool to room temperature and refrigerate, 8 hours to overnight. Remove the fat from the top of the stock. Bring stock to a boil; reduce heat to low, cover pot, and simmer. Heat milk in a small saucepan over medium heat; add butter and cook until butter is melted, about 5 minutes. Gradually stir semolina into milk mixture with a wooden spoon until mixture is smooth. Lightly beat eggs in a bowl and stir into semolina mixture until very smooth; season with salt and nutmeg. Remove from heat and let stand in a cool place for 30 minutes. Shape semolina mixture into small dumplings using 2 spoons or wet hands. Drop dumplings into the simmering stock and cook until tender, about 15 minutes. If you do not plan to use the stock right away, do not add salt because it can turn sour, especially in hot weather.